It is to these graves that the children come on Memorial Day, bearing flow­ers in their hands, exotic blooms from costly greenhouses, and the simple posies of old fashioned gardens. The voices of perfervid speakers vigrate with emotion and the sweet, poignant death hymns are borne on the perfume laden air. It is a splendid function, magnificent and satis­fying this of Memorial Day, for even the dullest orator cannot hide the luminous spirit of it, the apotheosis of pure pa­triotism and noble deeds, by his turgid flow of words. That which is done in the name of the dead is for the living millions, and the tens of millions yet unborn. Arlington once was the property of George Washington, and about it cluster many memories of the time when the na­tion was in its swaddling clothes. It be­longed to Robert E. Lee when the Civil War broke out, and it was in the old mansion that the Virginian soldier wrestled with his, conscience, and finally decided to cast his lot with the Confefederacy—a decision that meant much, for he was one of the world's great mili­tary geniuses. Time was when the old mansion was the scene of many activities, and the thought of death was farthest from the minds of those who worked and played and laughed there. General Washing­ton had a fine eye for valuable land; in fact, in these days he would be called something of a real estate speculator. Mount Vernon, Abingdon, and Arling­ton were among his possessions on the southern shore of the Potomac. He be­queathed Arlington to the little boy who stood beside him when he was sworn in as the first President of the United States, his foster son and the grandson of his wife, George Washington Parke Cur­tis. When Mrs. Washington died, in 1802, Mount Vernon passed into the hands of Judge Bushrod, the general's nephew. Then the foster son, who had lived at Mount Vernon since childhood built a mansion on the plantation left him by Washington, and thereafter he was usually known as “Mr. Custis of Arlington." For a few years he kept bachelor's hall, and then he married. It was at Arlington that he wrote his memoirs of General Washington, prac­tised many arts, and became famous for his eloquence and hospitality. He wrote poetry, decorated the walls of his home with his own paintings, and attempted battle pictures, but with indifferent suc­cess. 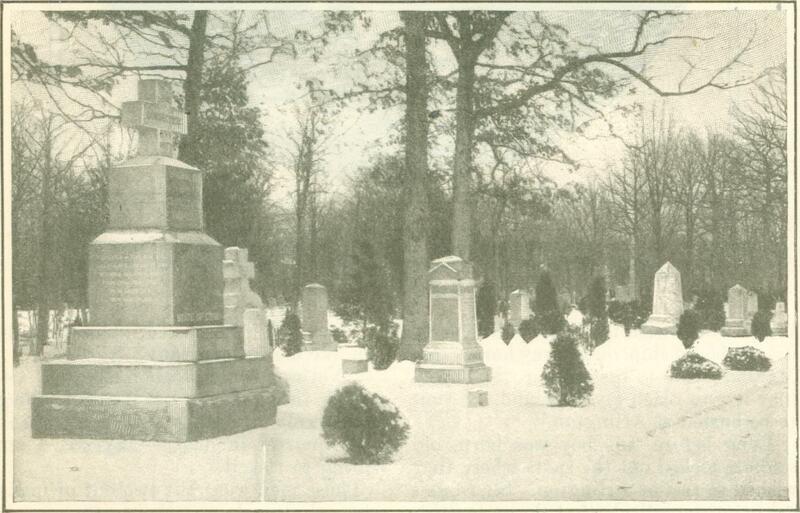 Upon the green lawns and slopes, under which the dead now lie, there were once merry parties. On these occasions Mr. Custis used to set up an old tent which General Washington used during the Revolution, and under its weather stained canvas brilliant men made elo­quent speeches. This tent was the great attraction at the annual sheep shearing contests which Mr. Custis introduced in this county, to encourage the manufac­ture of cloth in the United States. These contests took place late in April. His praises and prizes developed a friendly rivalry between the farmers of Virginia and Maryland, and he made the most of this. In one of his speeches at the an­nual gathering, standing in the shadow of Washington's tent, he said prophetic­ally: "America shall be great and free, and shall minister to her own wants by the employment of her own resources. The citizens of my country will proudly appear when clothed in the product of their native soil." On the occasions of parties, Washing­ton's silver tea set, made in New York in 1789 of old family plate, was used. The dainty ladies were wont to "kiss the cup" before drinking its contents. Ar­lington House was filled with relics of Washington, many of which in later years found their way back to Mount Vernon, while some are still treasured in the National Museum at Washington. In one of the upper chambers stood the bed on which the first Presi­dent died. It was regarded as too sacred for use. It now stands in Washington's death chamber at Mount Vernon. On the occasion of Lafayette's visit to America, seventy five years ago, he so­journed at Arlington. He took great delight in the society of his host, who could talk so well and lovingly of his beloved commander in chief. In his rambles about the grounds he was shown a magnificent willow tree, planted be­fore the Revolution by John Parke Cus­tis. He was delighted to observe its growth, for its fame had spread among lovers of forestry. It had been given to Mr. Custis by an Englishman who came to this country with the intention of making his home here, and of planting the little twig of English willow so that its green feathery ribbons would dangle over his roof. But the war upset his plans and drove him back to England; and as he departed, he presented the wil­low twig to John Parke Custis. It is interesting to know that the Arlington tree was the parent of many of the same species now growing in this country. The oaks of Arlington, too, are fatuous, and it is due to Lafayette that so many of them are standing. At the time of his visit, Mrs. Custis remarked that she thought they should be felled. "My dear child," said Lafayette, "recollect how much easier it is to cut down a tree than to make it grow." This remark passed down through the years that followed, and his advice has been kept as far as possible. The hon­ored dead who now sleep beneath the sheltering branches could have no more glorious memorial wreaths. Mr. Custis had his share of sorrows, too, for only one out of the four daughters born to the house lived to the age of womanhood. She, Mary Randolph Cus­tis, was the light and life of the place. As a child she romped with Robert Lee, as a girl she was his little sweetheart, and the old road that lies be­t we en Alexandria, where Lee lived, and the Arlington estate, was the scene of many of their rides and walks. In 1832 she was married to him—he was then a lieuten­ant of engineers—in the big drawing room. Her mother, Mrs. Custis, died in 1853; her father lived four years longer, his days shadowed by signs of the com­ing national storm. 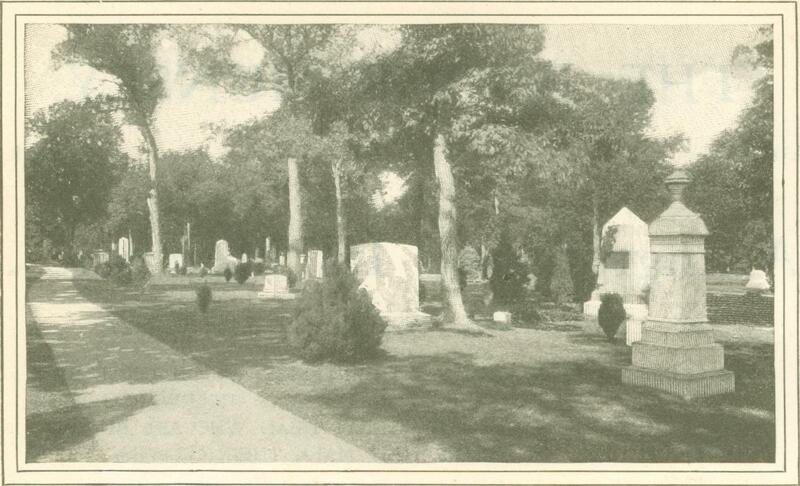 Their monuments are in a sequestered part of the grounds, seldom sought nowadays by those who visit the cemetery. The daughter, Mrs. Lee, inherited the estate, and she and her husband made their home there in the temple-like building her father erected. It was on its broad portico that General Lee talked with Francis P. Blair, whom Lincoln had sent to offer him the command of a division of the army which the new President was plan­ning to raise. "Say to the President," said General Lee, "that I have decided that I can take no part in an invasion of the South­ern States." A day later, when news of the Balti­more riot came to him, he resigned his commission in the United States army. He journeyed to Richmond, and when Virginia passed the ordinance of seces­sion, he took command of her forces. 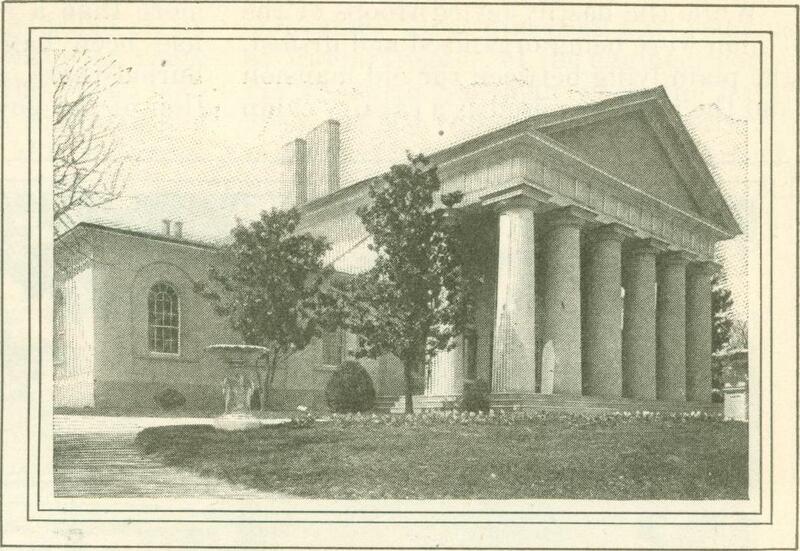 General Lee's fam­ily joined him at Richmond. On May 24, the Federal troops took possession of Ar­lington, and began the circling of its neigh­borhood with forts. The priceless Wash­ington relics were confiscated by the United States govern­ment, and, as the war waxed, camp, hos­pital, and burial ground spread them­selves over the old plantation which the first President gave to his posterity. 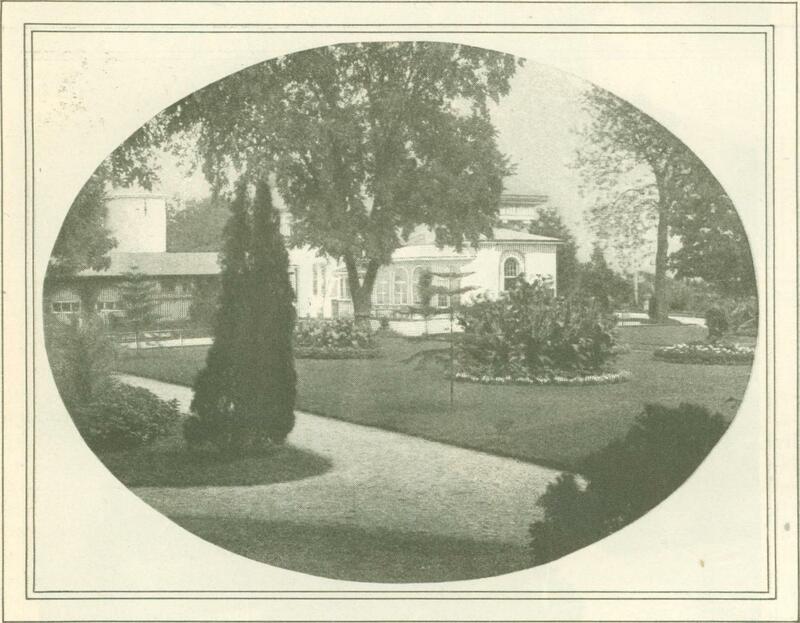 While the hastily levied troops of the Union were being organized and drilled, the plain lying between the old mansion and the river was used as a cavalry camp more than a score of years the ground had been hallowed by the brave men buried there, and it was not the inten­tion of the government to let the place and parade ground. The house was General McDowell's headquarters, and from there he marched at the head of his army to his disastrous defeat at Bull Run. 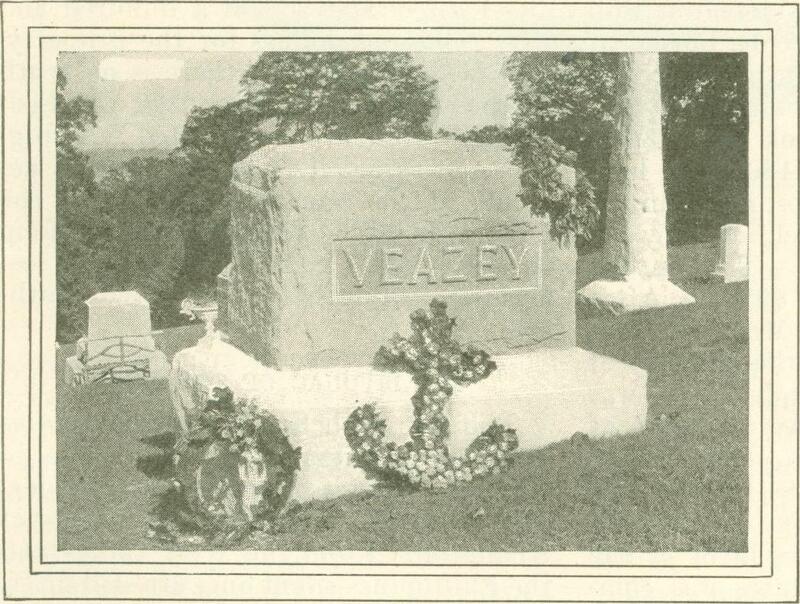 One of the first to be buried at Arlington was a Southern prisoner who died in the hospital there. The United States took formal pos­session of Arlington in 1864, the land having been sold for taxes, according to an act passed in 1862, and bid in by the government for $26,800. The amount of the taxes due was but $97.07. After the death of General and Mrs. Lee, their son commenced suit for the recovery of the estate, on the ground that it was impossible for Lee to pay the taxes at the time, he being in the Confederate Army. From 1877 to 1884 the case was in litigation. Then, when Justice Mil­ler rendered a decision in favor of the claimant, the United States was com­pelled to make a direct purchase of the estate from the Lee heirs, or to acquire it by condemnation proceedings. For more than a score of years the ground had been hallowed by the brave men buried there, and it was not the intention of the government to let the place pass from its hands; neither were the Lees over anxious to acquire a cemetery, so a compromise was effected by which the United States paid a hundred and fifty thousand dollars for the property. "It will be seen that there is no truth in the oft repeated story that the Fed­eral government "confiscated" Arling­ton, or wrested it from the Lees on ac­count of the part they played in the Civil War. The Lees were not among the many old Virginia families who lost their all through devotion to the South­ern cause. The war with Spain and the service that our soldiers have since done in tropical climates have made a consider­able addition to the rows of graves at Arlington. From the West Indies and the Philippines silent ones are still drift­ing in steadily to the peace of Arlington. They were children of the North, of the South, of the East, and of the West, but a common cause called them, and when their part in it was over, there was no greater honor for their dead bod­ies than to be buried with Sheridan and Porter and Lawton, by the Potomac. By common consent, Arlington has been made the great national cemetery, and it is the last wish of many a soldier lad to rest there with the brave. One such, dying aboard ship, on his way home from Manila, wrote to his mother, "I hope I may live to reach my own land. I want to be buried at Arlington." Long before this boy was born, old soldiers picked out the spots where they wished to rest at Arlington. Sheridan's grave on the hillside that slopes towards the east was chosen by him, and entered in the cemetery books long before his end came. Near him is all that remains of Major Gregory, of the engineer corps. He was with Sheridan when the latter chose his last resting place, with the re­mark that it was the one part of Arling­ton which he could see distinctly from his Washington residence. This set the major to thinking. "General," he asked, "how would you like me for company?" "Nothing could please me better," re­joined the general. "We got along very nicely in life, and I don't think we'll quarrel in death—anyhow, I am willing to risk it." These men were but two out of many who calmly selected their own graves. Wives of soldiers are also entitled to burial at Arlington. The government pays for the opening and closing of the graves, and for the erection of a white, stone, but nothing more. 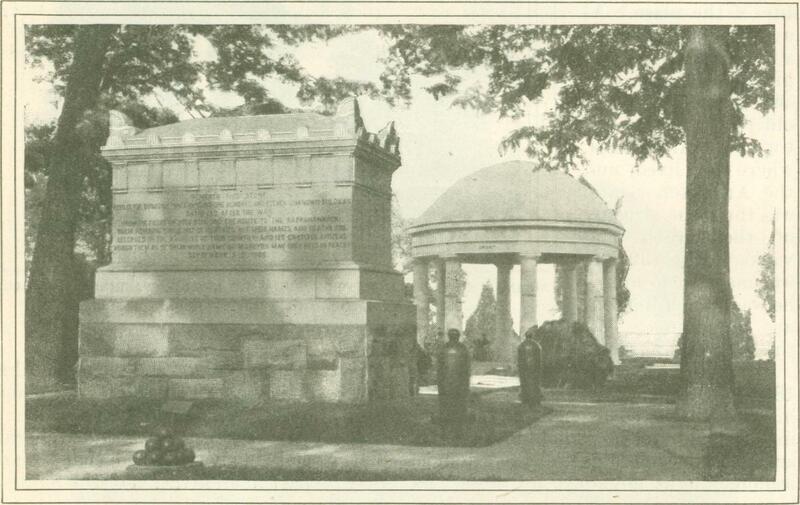 The Sheridan monument, said to have been de­signed by Mrs. Sheridan, is simple but striking. Against the granite the bronze medallion portrait of the old sol­dier, draped with flag and palm wreath, forms a fitting memorial, and one that recalls the man to those who knew and admired him. 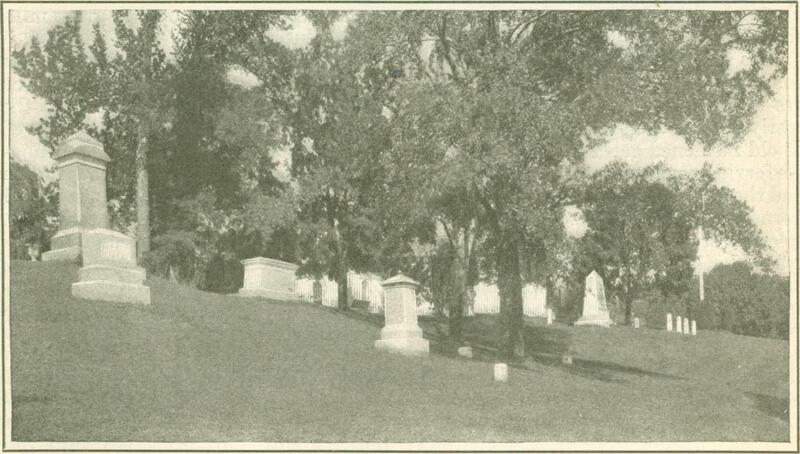 Other graves on this beautiful slope are those of Admiral Porter, General J. H. Baxter, Colonel Hiram Berdan, and General George Crook, the famous Indian fighter. Law-ton's grave is directly west of the am­phitheater, in a section where many sol­diers of our latest campaigns are buried. The gates at the entrances to Arling­ton are monuments to brave men, as is the classical Temple of Fame, to the south of the mansion. The Ord-Weitzel gate leads to the oldest portion of the cemetery below the hill. 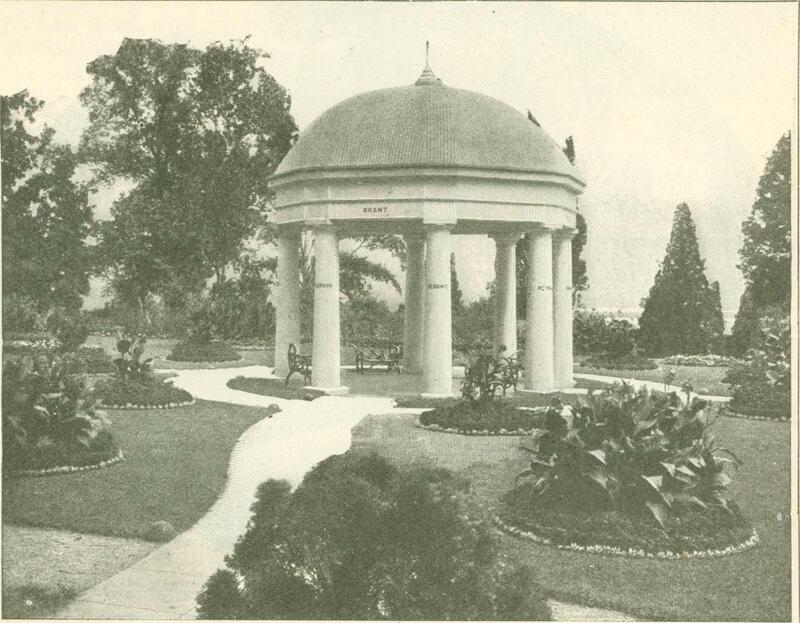 Its pillars were in a part of the War Department build­ing which was torn down to make room for the handsome structures of the State, War, and Navy. 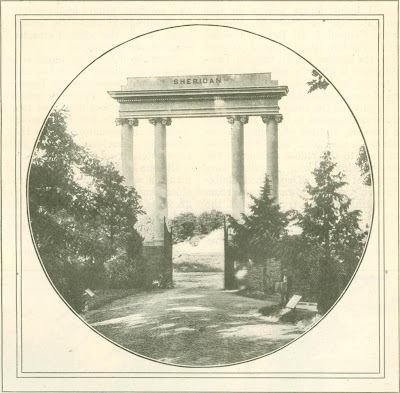 The Sheridan gate leads to the center of the grounds, and its four columns, bearing the names of Scott. Lincoln, Grant, and Stanton, were also part of the old War Depart­ment building, which was erected short­ly after the close of our second war with Great Britain. The southern entrance to the cemetery is called the McClellan gate. The Temple of Fame bears upon the eight columns that support its dome the names of Garfield, McPherson, Mansfield, Thomas, Meade, Sedgwick, Reynolds, and Humphreys. Above the two northern pillars appears the name of Washington; above the south, Lin­coln; above the east, Farragut; and above the west, Grant. Near the Temple of Fame is an im­pressive monument which has suggested many poems, known as the Tomb of the Unknown Dead. The vault beneath the tomb is thirty feet deep and two hun­dred and twenty feet in diameter, and contains the remains of more than two thousand nameless soldiers gathered from neighboring fields of battle. On one side of the walk behind the mansion are the servants' quarters of olden time, the well, whose wheel is kept groaning by those who visit Arlington, and the greenhouses. On the other side is the amphitheater, erected in 1873, and used for memorial exercises. It will accommodate five thousand persons. 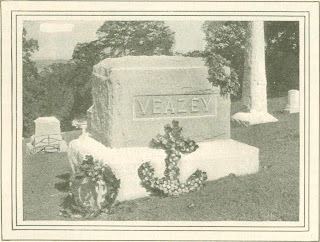 From the Junior Munsey, June 1901.